What a thrill it was to open up the January issue of GQ and see an excerpt from 08: A Graphic Diary of the Campaign Trail, the forthcoming book from Dan Goldman (who we humbly note was catapulted into acclaim here on SMITH for his incredible co-creation with Anthony Lappé on Shooting War) and big political scribe Michael Crowley. 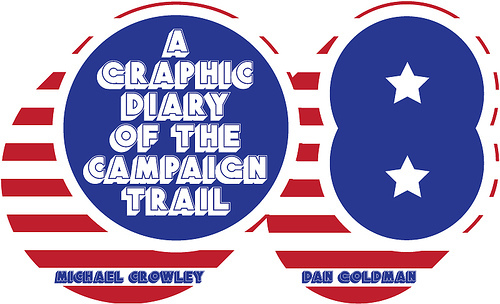 The duo have been deep in the mix on the campaign trail to document the election for 08, which pubs this fall from Three Rivers Press. The GQ piece takes the chicken’s-eye view of Giuliani campaigning in South Carolina. It’s smart, funny, colorful, and perfectly timed for the events before us on these intense primary days. Congrats to D—among the very best artist, thinkers, and men we know. Two other personal stories of note in the same issue of GQ: In “All My Children,” an anonymous sperm donor reflects on his many possible progeny, and his decision as to whether or not to allow his identity to be revealed to those who believe he’s indeed their father….or at least half their creator. And in “G-L-O-R-Y,” the always incredible Jeanne Marie Laskas gets inside the life and mind of the Ben-Gals, the cheerleaders for the Cincinnati Bengals. It’s a moving, deeply personal portrait of women who make nearly nothing for it, but do what they do because they simply cannot imagine a world in which anything could be better. Both pieces are fascinating windows into other peoples’ obsessions.